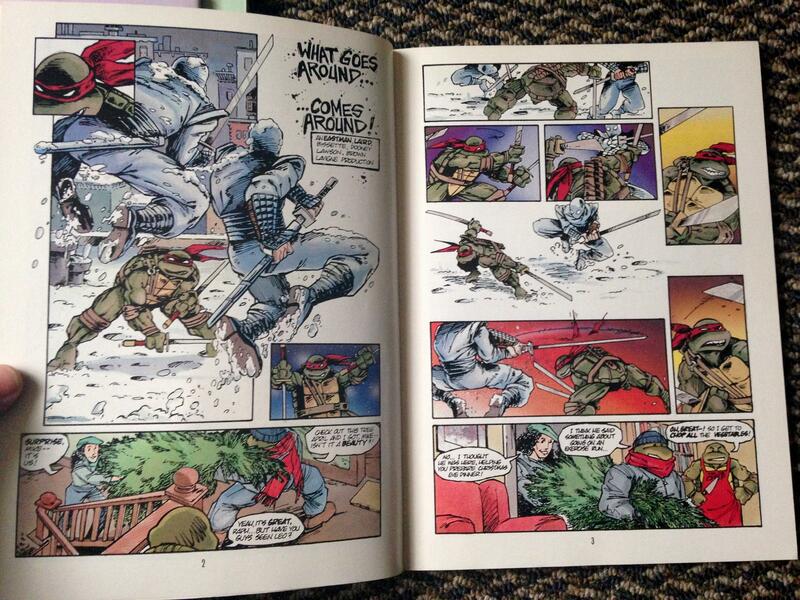 IDW has lately been reprinting the earliest and original Teenage Mutant Ninja Turtles comics from the 1980s. Back in the 80s, prices of first prints of the original comics skyrocketed, and they still retain a fairly high collector’s value. In response to their limited availability to all but the wealthiest collectors, First Publishing produced four full-color oversized graphic novels from the original black and white stories. 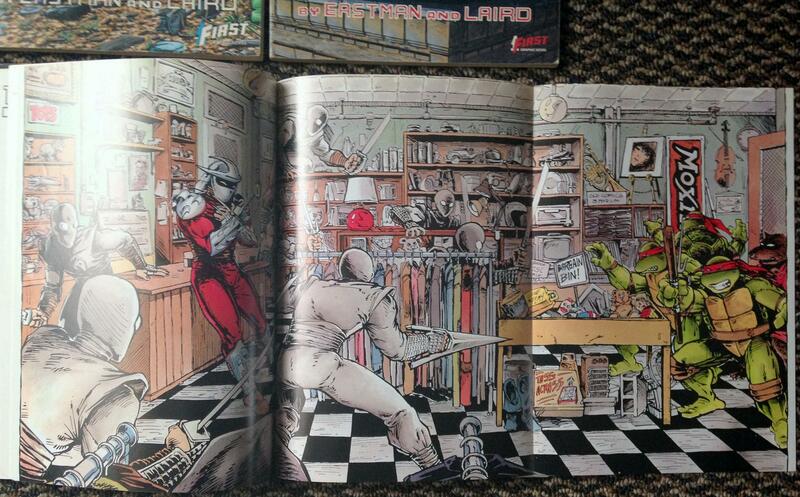 The unique and gritty visual style of Eastman and Laird’s reptilian martial artists comes through even in color. First did a wonderfully professional job on this production. 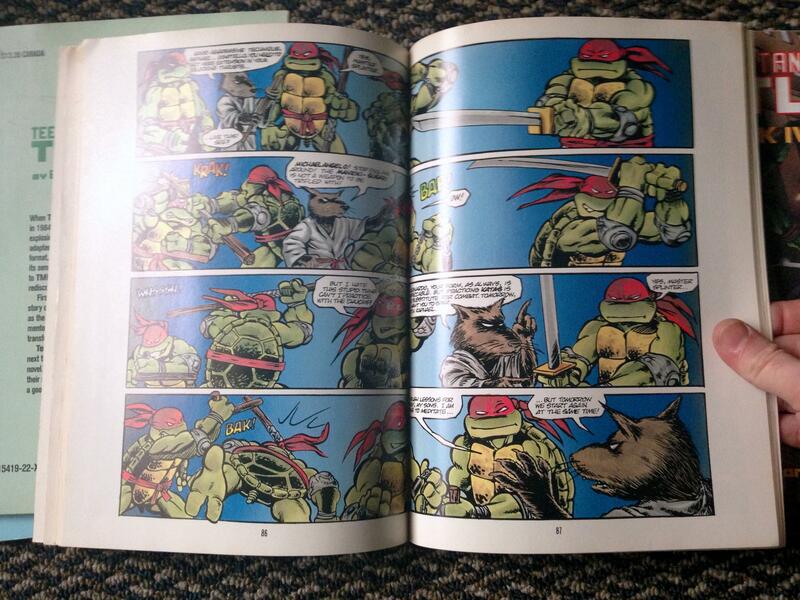 They wisely included the Leonardo one-shot, since its story leads right up to the events of issue #10. 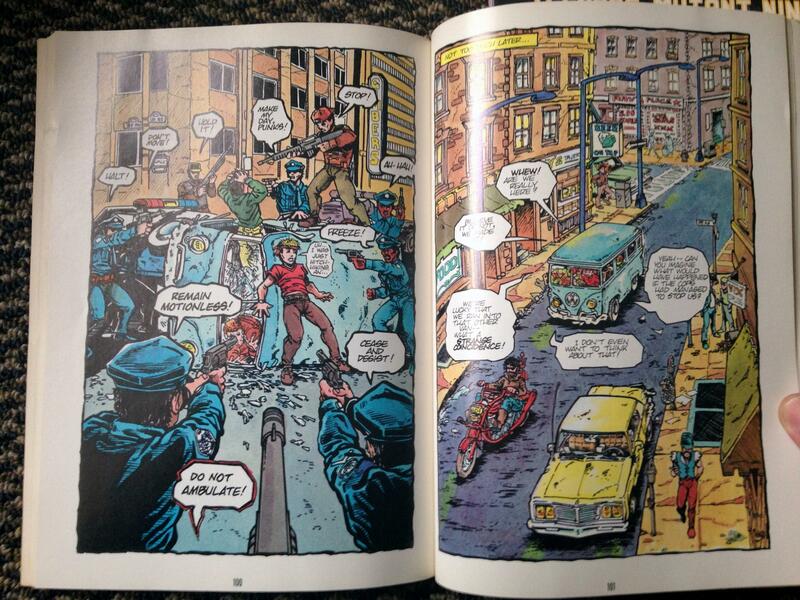 And, First thoughtfully preserved the dramatic three-page fold out from issue #10. 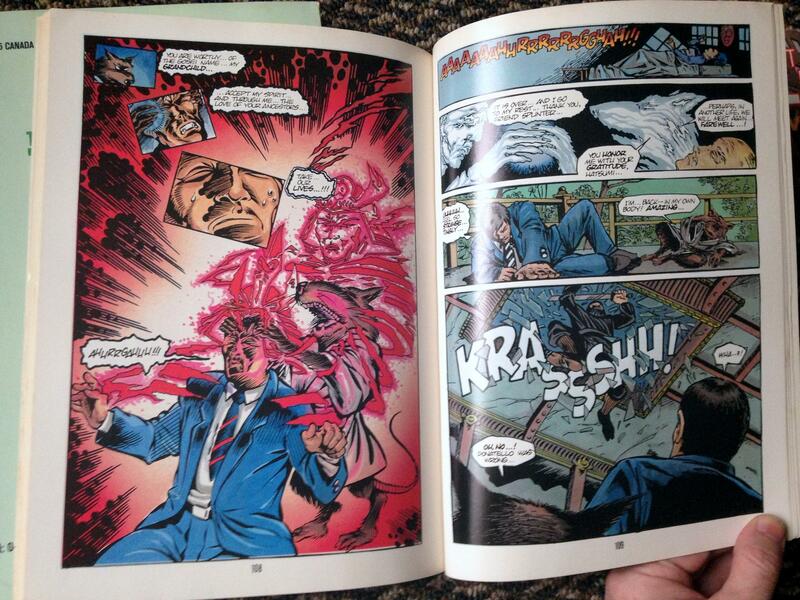 We have scans of the original black and white pages in our archives for comparison. But all of the splash pages look great, and the binding and paper quality of these turtle tomes remains evident decades later. From the first issue to the battle with Triceratons in space to the hilarious Cerebus crossover, all of the Turtles earliest adventures rock hard in this graphic novel format. 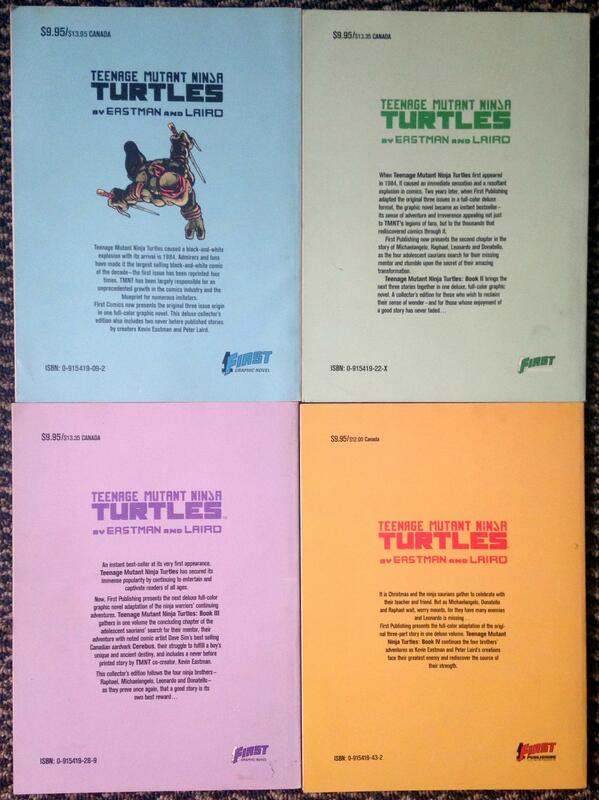 Let us offer a few suggestions for those seeking some high-quality Turtles reprints. 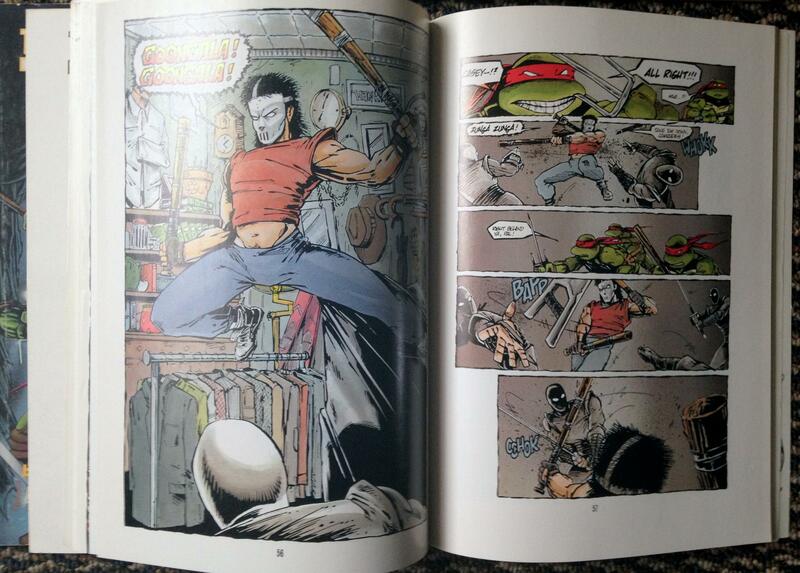 You can still find copies of the Teenage Mutant Ninja Turtles TPB by First in stock at reasonable prices ($10-$15 for a Fine copy,) though you may need to go to eBay to get a complete set all at once! 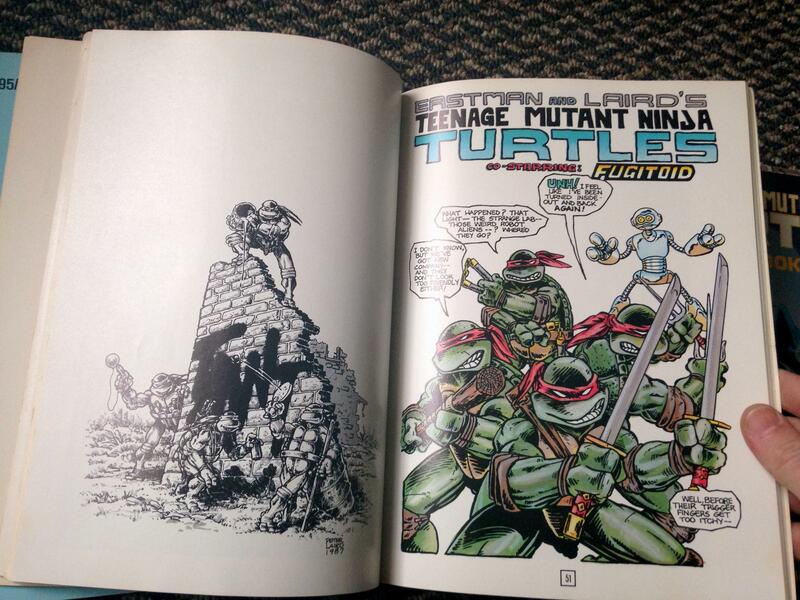 IDW printed the stories in single issues in full color as Teenage Mutant Ninja Turtles Color Classics, but it seems they left out the Leonardo one-shot to include issue #11 which more or less wraps up Eastman & Laird’s original plot line. A second volume of color classics reprints some excellent adventures from the subsequent stories, including a reprint of the glorious Return to New York storyline this spring. 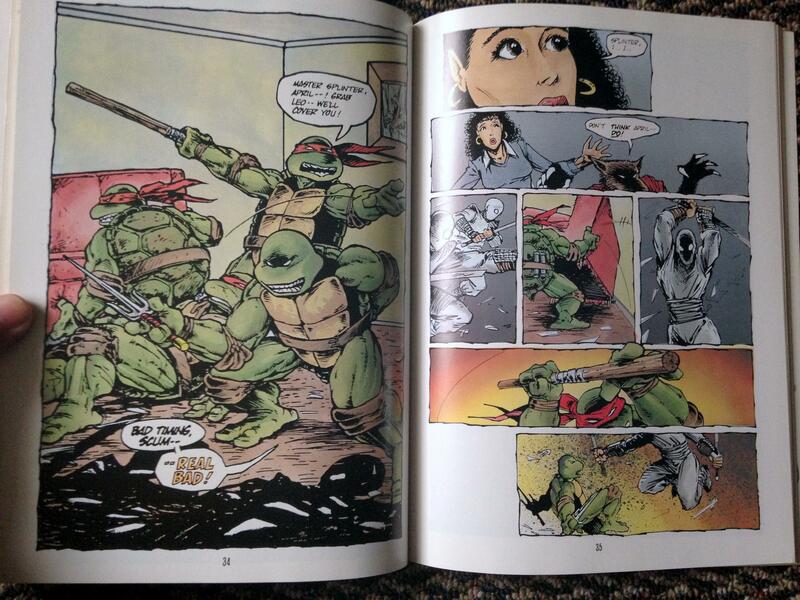 Those who want these stories in black and white should get the excellent seven-volume Teenage Mutant Ninja Turtles Collected Book produced by Mirage in the 1990s. IDW more recently gave us The Ultimate Collection in hardcover which wisely includes the one-shots from the 80s as well as the original title. Despite the availability of recent reprints, the old ones have managed to hold onto their collector’s value due to their limited runs and high production values. The First Publishing collection also gives you a much larger page size than, say, Mirage’s normal-zized Collected Book reprints. Clearly IDW has much to gain by reprinting these collectible issues, but they also do readers a great service by keeping these classics in print. We sold both the First TPB set and the Collected Book set on eBay last year, but you can bet we would like another copy of Return to New York in our hands before all this is over! 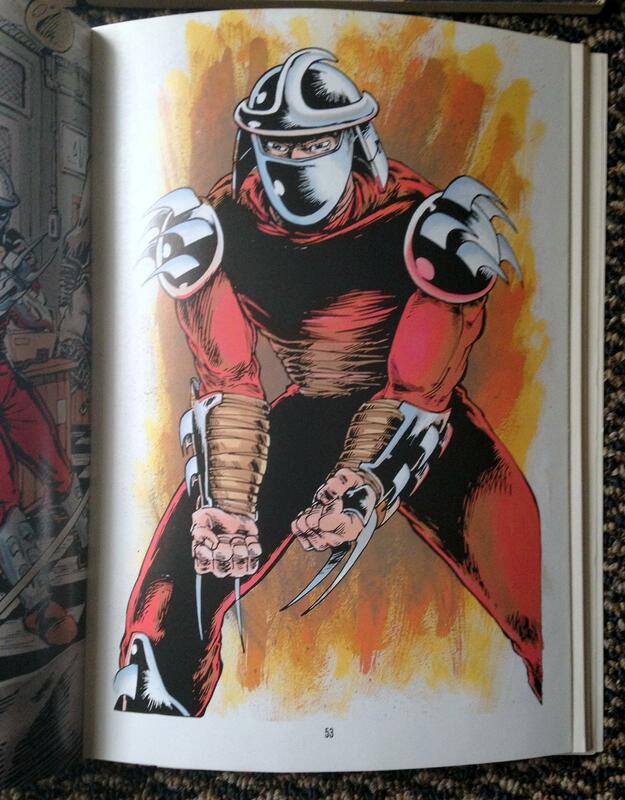 Something to clarify – I remember looking at those Color Classic issues when IDW released them. They’re not the same color as the First graphic novels, right? They’re new color – and not as good as the coloring in the First graphic novels. To me, those First graphic novels are without equal. (I only wish they had included the Fugitoid one-shot, since that issue, like the Leonardo one-shot, also ties into the storyline.) They were my first introduction to the Turtles, and I’ve since collected as many of the original issues as possible (as many as I can afford). IDW has put out a lot of collections, but from what I’ve read, none of those collections are without problems of one kind or another. 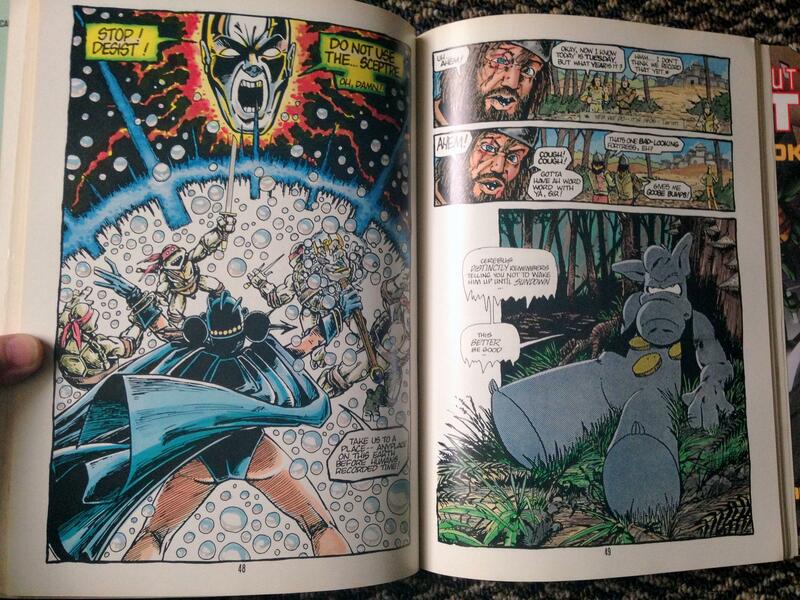 You’re also absolutely right about the paper quality and binding quality of the First graphic novels. It’s cool that reprints are still being done, but with my First collection and the original issues, that’s about all I really need. Well, except for the newspaper comic strip. I’m still waiting for that to be collected in some sort of really nice hardcover. I really hope it happens and I hope it gets done right. Thank you for dropping by and commenting, Brandon. You’re right about the IDW “Color Classics”. Their descriptions include “newly colored tale” and “all-new color”, for example. I haven’t ever done a side-by-side comparison to the First graphic novels, but that original color was amazing even by current standards. 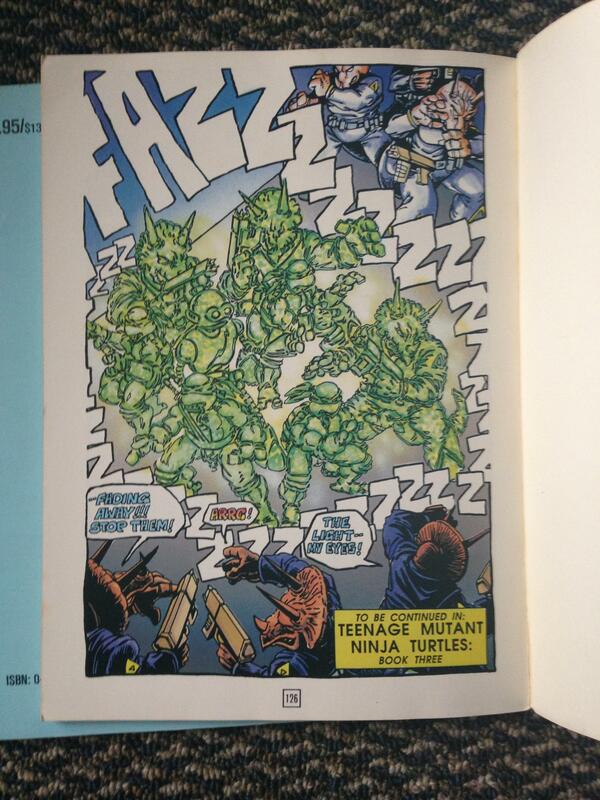 There is this article on TMNTentity which compares the different colorizations of TMNT #1. Pretty interesting. I share Brandon’s thought, a collection of the newspaper strip would be fantastic. Thank you for dropping by and posting that link! 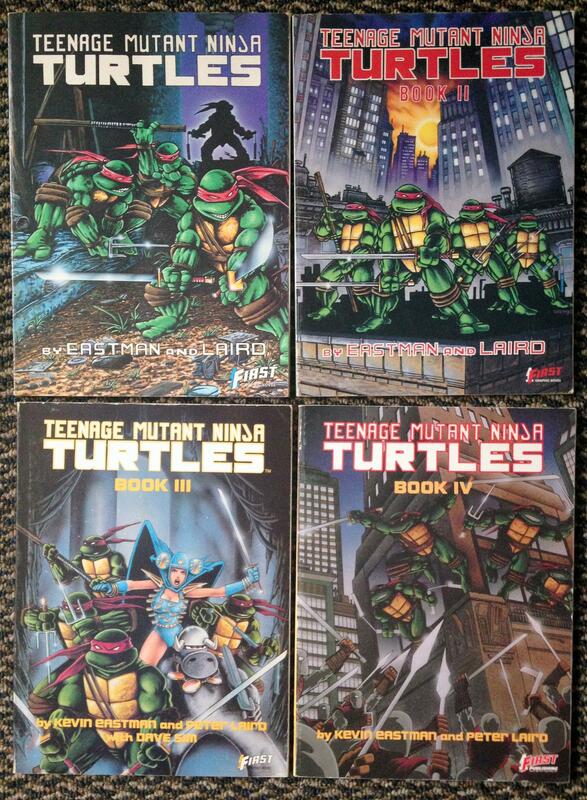 I have a set of these four books signed by Kevin Eastman. With authentication certificates on the signatures.